Strategic HR Management - strategic Human Resources, Inc.
What should we be doing differently, as a small/medium-sized business, to strategically manage our HR function? No matter what the size of your organization, it is important for the Human Resources function to be strategically aligned with the business goals and strategies of the company. To start, you need to understand the purpose HR serves to the organization. Regardless of whether an individual handles HR as part of their other duties, you have a one person HR department or a full HR team, the purpose of HR will need to be defined specifically for your organization. Does HR exist to administratively process paperwork and track employees? Is it to enforce rules and manage employee relations? Or maybe it is to be a coach or advisor to the company on employee and management issues. Whether it is a task-based role or a strategic role, it is important to determine this purpose. Ensuring clear expectations are set with the (sales) team including measures that will be used to evaluate performance. This is just an example, but gives an idea of the type of thinking that takes place in order for HR to be a strategic solution for the company. Shuffle priorities – is there something you are doing that could be delegated or outsourced to free up time to work on strategy? Identify subject matter experts – are there others in the organization that have the expertise needed/have an interest in developing by working on a special project? Assemble a team – can the strategic goals be met with a team effort rather than by one person? Use an outside expert – do you need to outsource the project (to someone like strategic HR inc.) to get the project done in a timely manner with the right expertise? Once the HR function has its’ goals clearly defined in conjunction with the corporate strategy it will be easier to identify areas in which HR needs to make adjustments to be more strategically aligned with the organization and with the leadership team. As with the organizational strategic plan, the HR strategy will need to be revisited and revised periodically to address changes in the organization and the goals of the company. Are daily HR issues interfering with your ability to focus on the strategic matters of your company? Do you find yourself at odds with the directives of the leadership team? 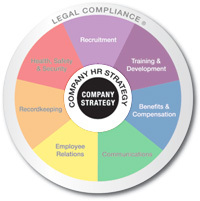 Strategic HR, inc. knows how integral human resources is to the health of your organization and can assist you with HR strategy needs. Visit our HR Strategy page to learn how we can assist you with your strategy and help align your goals. Is This a Solution to Help You Become More Strategic?